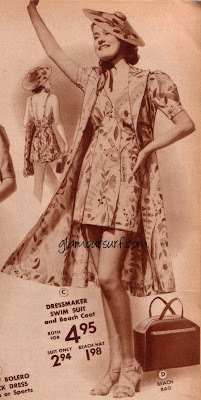 I pulled out some of my vintage catalogues today. What fun they are to look through. 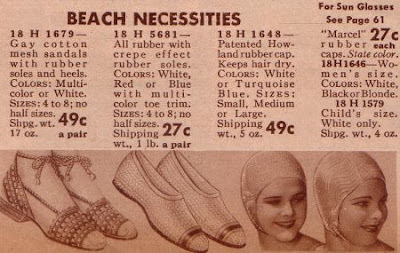 These images are from a Sears Spring & Summer 1938 mail order catalogue. The catalogue itself is about as thick as a modern phonebook and has everything you could ever need for your home or wardrobe. 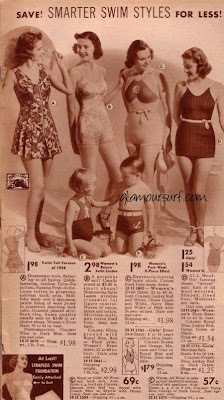 The beach outfits and swimsuits are all on a grand two pages. Go figure?!? There are about a dozen pages just focused on girdles and corset's. I also spent some time gazing at all the hats. But less I digress, onto the swimsuits! Perfect 1938 model of real high grade. Mast of fast-colored, pre-shrunk cotton twill in a gloriously bright Tropical print. Smart promenade coat flares gracefully from fitted waist. Swim suit has wool jersey lining in matching color. Coat and swimsuit $4.95, the lined swimsuit alone $2.94. b)Shimmering satin Lastex stretches crosswise for figure control. Woven or Rayon, cotton and Lastex. Skirtless style with cotton lined front, deep sun back. $2.98. d) All wool. Our famous classic 'skirted' suit. Of all worsted wool. Shaped lined bust, moderate sun back. $1.54. Really, aren't the beach shoes just adorable? g)the top one is a zip-fastened detachable shirt of Zephyr wool. Heavy 2 ply wool worsted trunks $2.98. j)Athletic cut white Zephyr wool shirt, zip fastened to trunk. all worsted wool $1.98.